***We regret to inform you that in light of inclement weather forecast for Saturday, we are canceling this year’s Art on Main. We have spoken with a meteorologist and the forecast is for rain through at least 8 p.m.
We did not arrive at this decision easily and consulted, in addition to the meteorologist, a number of participants, Chamber Foundation Board Members, and volunteers and decided that this is the best decision so as to protect the artwork. The Jenks Chamber of Commerce Community Foundation has announced the details for the 2018 show, the sixteenth year for the event. 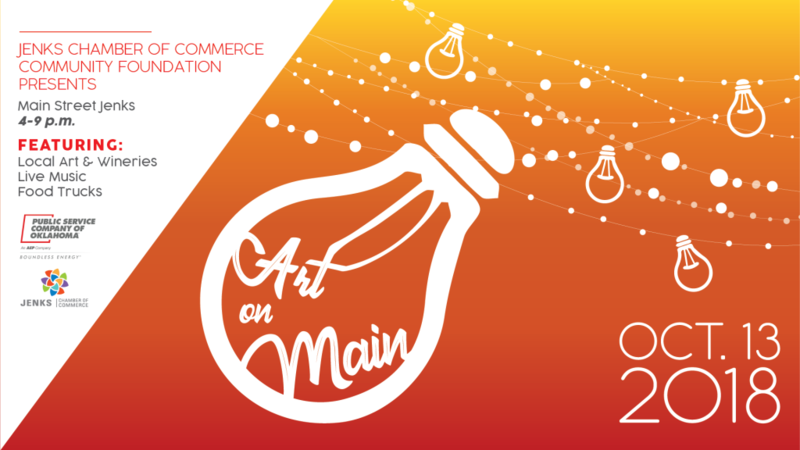 Art on Main is an award-winning art show featuring art and wineries in addition to upscale food trucks. This year’s event features enhancements to the show including a later start and end time, and allowing artists from outside Oklahoma to also apply to the juried art show. Art on Main’s mission is to create access to a broad array of arts experiences, nurture the development and understanding of diverse art forms and cultures and encourage the expanding depth and breadth of cultural life in Oklahoma. For more information, visit jenkschamber.com or contact the Jenks Chamber at 918.299.5005 or art@jenkschamber.com.